An excited phone call from daughter Shanae announcing an upset win for underrated galloper Ram Sam Sam was the perfect start to an idyllic morning in Athens for trainer and part-owner, Gemma McKay. McKay and husband Graham are coming to the end of a four-week European getaway which has them currently enjoying the sights and delights of a Mediterranean cruise. Daughters Shanae, Kacie and Kalah are in charge of the Levin-based operation with mum and dad away and took seven-year-old Zed gelding Ram Sam Sam to Waverley on Saturday to contest the open 1400 contest. Despite some handy form of late Ram Sam Sam wasn’t expected to figure against red-hot race favourite Dolcetto and some other handy performers. 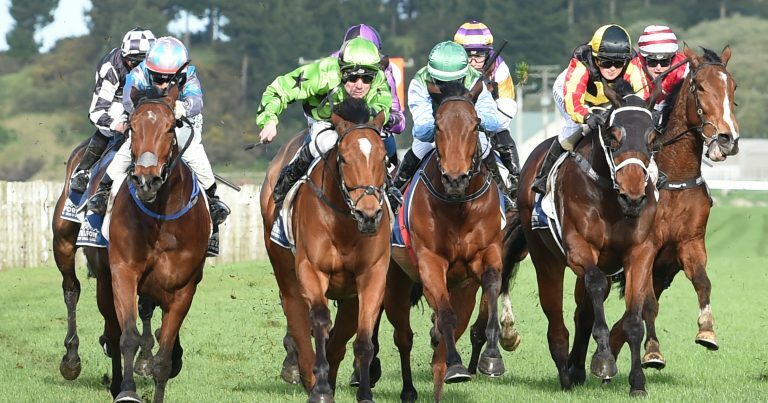 Rider Tim Johnson and his charge had other ideas as they dominated the event from in front to land a deserved victory from Matamata raider Hello M’Lady. “I couldn’t believe it when I got the text and then a call from Shanae,” McKay said. “She just started shouting he won, he won and I pretty much burst into tears it was so exciting. “We’re not anywhere where we could watch or listen to the race so when we got the call it was just amazing. McKay has plenty of faith in her charge who has had a chequered career due to injury niggles. “We’ve always known he was a good horse, but he has had plenty of problems along the way,” she said. “He has had injuries at key times which has held him up but I have always thought he could win a nice race. “Funnily enough he wasn’t even supposed to be in the open handicap as we had him ready for the rating 72 instead. “Shanae rang me during the week and said she had made a boo boo as she didn’t realise it was the wrong race until she saw Dolcetto nominated as well. “All’s well that ends well and we will definitely be celebrating now and when I can get some wi-fi somewhere to watch the replay, we will be celebrating again.